Offered for sale, “Maggie” is a modern filly that is sired our two-time AHR ‘National Champion Stallion’ and three-time AHR ‘Stallion of the Year’, Arno van het Nieshof. She is out of Mandolyn RVRW. “Maggie” has the elegance of her mother who comes from one of the strongest mare lines in the country. Her mother, who is sired by Walzertakt, was the second highest inspected mare at the AHR inspections in 2007. Of course her father, Arno, contributed to her overall movement as he is well known to strengthen this trait in all of his offspring. Maggie’s balanced and correct conformation is only surpassed by her great disposition and willingness to please, a trait that she derived from both of her parents. She is a favorite around the barn for her good work ethic while under harness and while she is being lightly started under saddle. 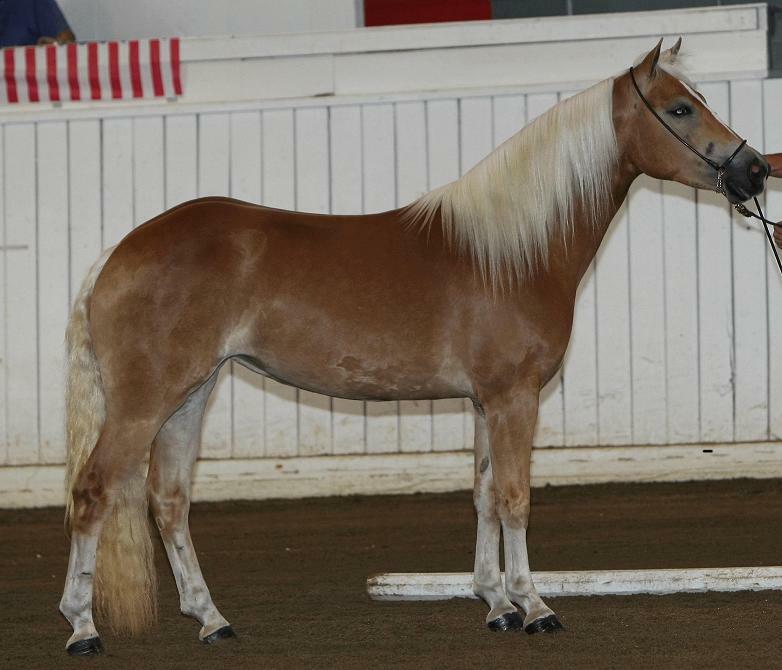 Although Maggie is the epitome of a modern haflinger, she was previously owned by Phyllis and Dave Brugger of Brugger’s Other Farm in Clayton, Michigan, and showed in the draft ring as a weanling, ultimately becoming the draft SIP champion in 2006. In 2006, she also was the 1st place senior weanling filly in the AHR Futurity, eventually going onto to capture the title of Reserve Senior Champion Weanling also. Since Maggie has taken up residence at Genesis Farm, she became a competitor in the pleasure arena for 2008, thereby proving that a good horse is a good horse no matter what facet of showing they are shown in. In August of 2008, in Horseheads, New York, Maggie received her official AHR inspection score. Maggie was scored at 81 points! This means that Maggie was scored as GOLD under the AHR Inspection and Classification system. This score means that Maggie ranks in the top 1% of horses in the world based on her conformation, movement and overall type. At Genesis Farm we are honored to have Maggie as part of our herd and see a bright future for her in halter, performance and breeding. At the AHR National Futurity in September 2008, Maggie was 1st place in the 2-year-old Pleasure Filly class and went on to be named pleasure ‘Champion 2-year-old’. At the GLHA Futurity in October 2008, Maggie won 1st place in the 2-year-old Filly pleasure class. Maggie’s harness and saddle training is progressing nicely. Although she has been sold to Wingspann Farm in Oregon, she will remain at Genesis Farm through the summer of 2009 in order to be on our show string. 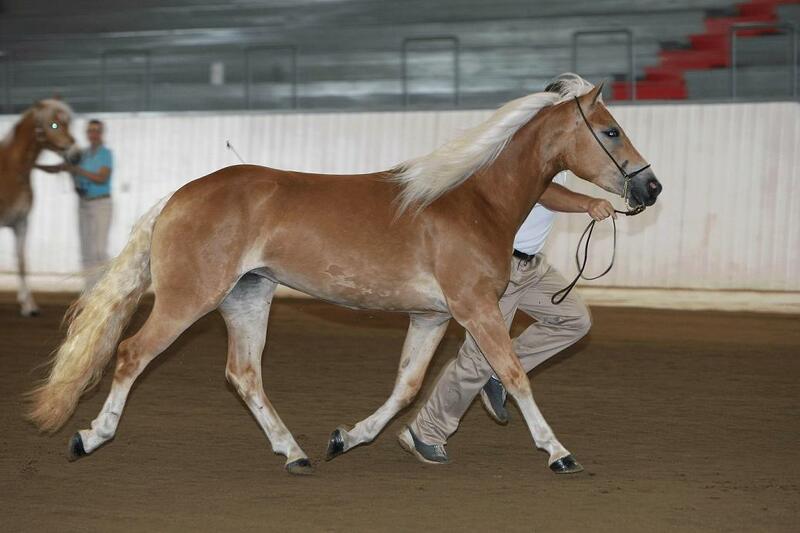 Maggie has been bred to our AHR GOLD classified stallion, Alfa of Genesis, for a March 2010 foal. We anxiously await this GOLD x GOLD cross.